Are you into art? 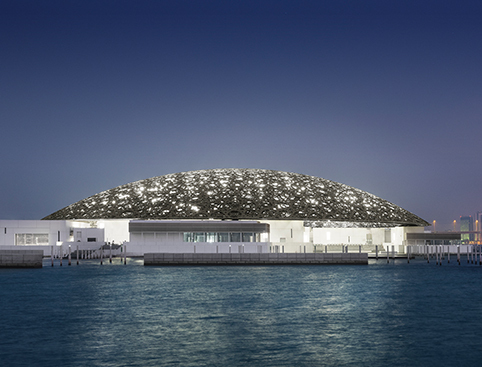 Well, you simply cannot miss out on the Louvre Abu Dhabi – it’s the perfect place for any arts aficionado! The museum hosts an incredible collection of historic art under the roof of a stunning new contemporary building. The artwork featured spans from ancient Arabian pieces to Leonardo Da Vinci and contemporary art. 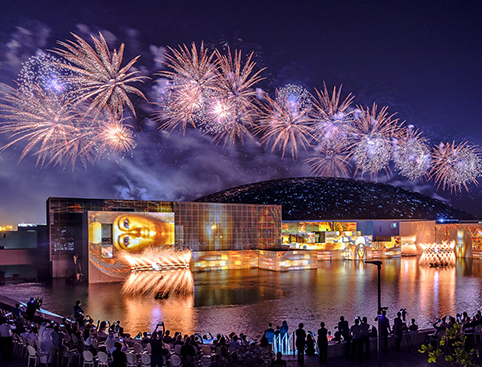 It’s a definite must-do in Abu Dhabi! 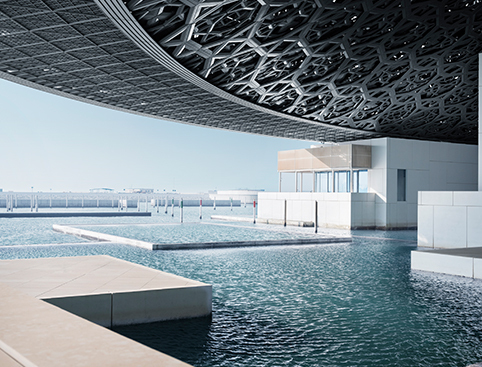 The Louvre Abu Dhabi tells the story of humanity through art in 12 thematic chapters. The art is grouped by historic period rather than geography, meaning you’ll see artefacts belonging to the same era from Asia, Africa and Europe placed next to one another. Struggling for time? There’s plenty to discover at the Louvre Abu Dhabi but the unorthodox method of displaying the artwork tells a clear story, which allows you to visit the museum faster, if you are in a rush. Don’t miss out on the temporary exhibits! Every year there are 4 different temporary exhibitions at the Louvre Abu Dhabi, each coming from a different museum partner in France (including the Louvre in Paris, of course). Make sure to check these out - you’ll be transported to Paris in an instant! But the star is the building itself…. Architecture is your thing? Then you must visit the Louvre Abu Dhabi, even just to see the building itself. A world-class contemporary architecture gem, it’s the latest work of French architect Jean Nouvel. With rays of Arabian sunshine streaming down through the iconic metal floating dome, the Louvre Abu Dhabi is a piece of art in itself. You won’t forget this one in a hurry! 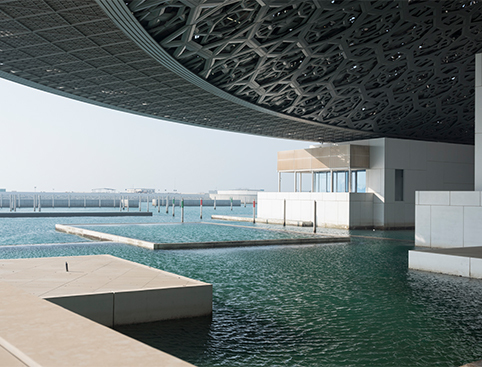 Louvre Abu Dhabi is suitable for wheelchair users. Wheelchairs are available for hire in the main hall. Lockers are available to hire in the main hall. Includes Museum Galleries, Exhibitions, Children's Museum and public spaces underneath the dome. 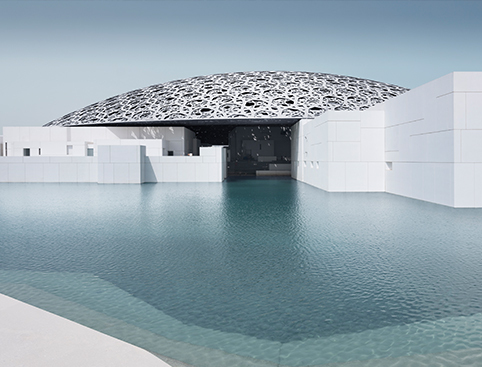 Children aged between 0-12 years receive complimentary entry to Louvre Abu Dhabi. Please call us to advise of any children aged between 0-12 years as a ticket will be booked on their behalf with the supplier. From Abu Dhabi City – From the Zayed Port area (Mena Zayed), follow signs for Yas Island and take Sheikh Khalifa Bridge to Saadiyat Island. Follow road signs off Sheikh Khalifa Highway E12 to the Cultural District to Louvre Abu Dhabi. First exit after the bridge. From Dubai or Abu Dhabi – Travelling on E11 Abu Dhabi – Dubai Road. Take Saadiyat Island/Yas Island exit on to the Sheikh Khalifa Highway E12 and drive through Yas Highway to the Cultural District in Saadiyat Island. Follow road signs off the highway to Louvre Abu Dhabi.